When I first started grad school in OSU’s College of Oceanography I learned a few important things. The first, is what the acronym “PhD” actually stands for (see title). The second was a trick for finding out if you were ‘really‘ doing oceanography, if it’s too heavy to lift, too expensive to lose, and you drop it to the bottom of the ocean anyway, then you are in fact doing oceanography. I’m not sure if I’m happy to report or not, but after three and a half years of grad school (I know, even I’m surprised I’ve been here that long) I can finally understand what I was taught on that fitful first day of class. To say that I’ve been busy is true, but isn’t very interesting. Busy is relative. So instead I’ll highlight a few of my major accomplishments from over the past month, and the friends and colleagues who helped me get there — because as I’ve said many times before, science is collaborative. 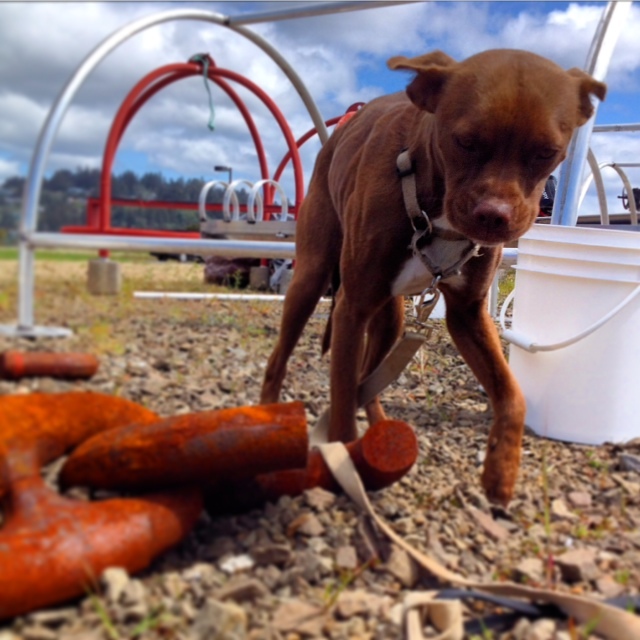 Luna Tunes inspects an errant chain link and wonders why we didn’t use this as an anchor. Team: Myself, John Flynn (my husband), David Culp (my intern), special guest appearances from Florence van Tulder of the Marine Mammal Institute and Vista and Luna Tunes (my dogs). My dissertation research hinges on the successful deployment of four Autonomous Underwater Hydrophones (AUH) which are mounted on aluminum landers and sunk to the bottom of the ocean in Glacier Bay National Park. These hydrophones are recovered six months later with the use of an acoustic release system (see my earlier blog posts from Antarctica for details on the acoustic release). This system only works if the hydrophones don’t drift away. There is no handbook for studying acoustic ecology (there is no really handbook for getting a PhD either… it’s more of a choose your own adventure book). While this system has been deployed in all the worlds oceans, each deployment is unique. Concrete, Aluminum, and lead. Whale research at its finest. Which means we had to design a mooring system, including the anchors. Sparing you the nitty gritty details of why I couldn’t just buy anchors (4 landers x 4 feet on each lander = 16 feet needing anchors = $$$$$) what ended up happening was a little lesson in density (100 pounds of concrete on land = ~ 60 pounds of concrete in water), a few hilarious interactions with the great folks over at Englund Marine & Industrial Supply (“Hi, I’d like to buy 600 pounds of lead cannonballs. 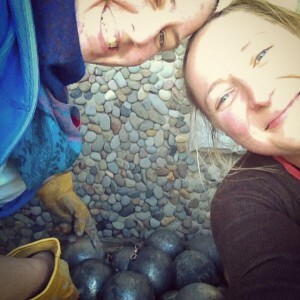 Oh, that’s all of the cannonballs? Ok, yeah. I’ll take them. And all of your 5-gallon buckets too.”), a few very long days of pouring concrete (where my intern David proved to be the most valuable intern on the face of the planet, and not just because his truck could hold 2500 pounds of concrete, and I realized I totally married the right guy), and voila we now have twenty lead/concrete anchors weighing 100-130 pounds each to keep our equipment snugly on the sea floor. Phew. Florence van Tulder and I after moving 600 pounds of lead weights from the back of my Mazda hatchback to safety at the Hatfield Marine Science Center. So, I am one of two student representatives to the Northwest Student Chapter for the Society for Marine Mammalogy (NWSSMM). I attended my first chapter meeting in 2012 and have been an active member in the chapter ever since. This year we offered to host our annual chapter meeting, for the first time, at Oregon State University. 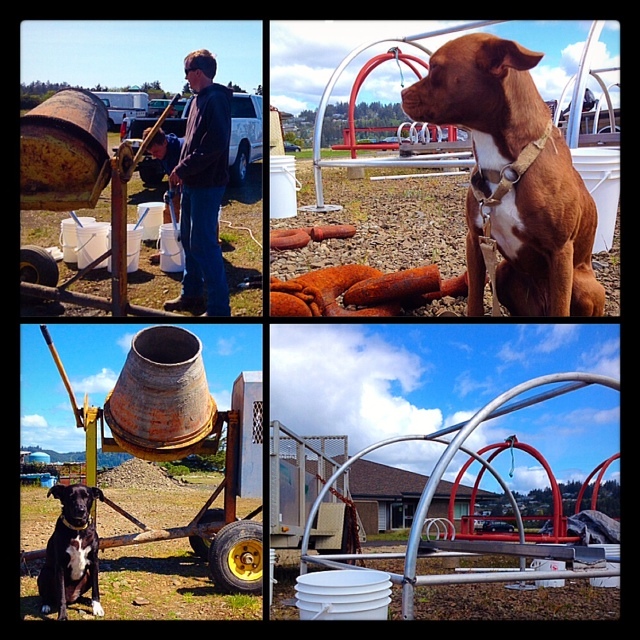 I spearheaded the conference along with Shea (mistress of swag) with the logistical support of ORCAA and the grad students of MMI. Kat and David jumped in to help with shopping and set up (phew). I’m also proud to report that this year’s conference was sponsored! The Hatfield Marine Science Center, the Marine Mammal Institute, and OSU’s Department of Fisheries and Wildlife all generously funded this year’s conference. As a result we were able to offer free registration to all of our undergraduate students, and to provide mugs to each of our conference attendees (with a super cool logo, designed by Shea). We had record high attendance with 70 conference goers, not including our panel of experts, and our generous graders (Holger was one of our generous graders- thanks Holger!). The feedback we got from our panelists (Drs. Leigh Torres of MMI, Markus Horning of MMI, Ari Friedlaender of MMI, and ORCAA’s own Sharon Nieukirk) was that the caliber of the presentations was impressive, the day ran smoothly (we had coffee breaks! ), and that the students were engaged. The feedback we got from our students was that the panel was insightful, the presence of a wide range of professionals at the conference was exciting, and that the keynote talk by Dr. Ari Friedlaender was “tha bomb”. The inclusion of a panel was new this year, and reflects the wide range of marine mammal professionals that we have in the OSU community. We talked a lot about the pros and cons of technology and the role of the human observer as well as the pros and cons of a PhD, and balancing life and work. I know that for those of you in the field of marine mammal science that this doesn’t seem like a breakthrough, but these fundamental topics are essential to both the progress of our field, and our humanity. 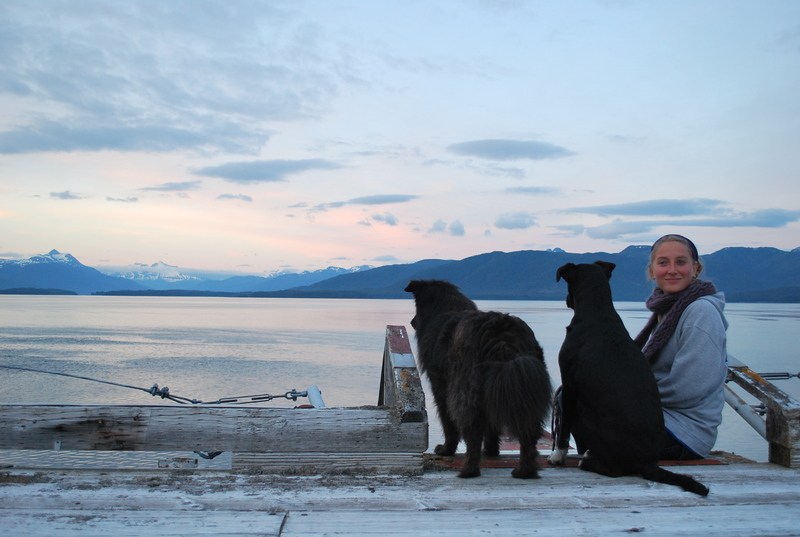 When asked what he looked for in a graduate student Dr. Markus Horning astutely brought up animal welfare, and seeking students who had a vested interest in the safety and health of the animals we study. Dr. Ari Friedlaender pointed out that a drive to understand the science is as important (or perhaps more important) than the drive to love the species. Sharon and Leigh both spoke up about the role of quantitative skills (modeling, programming), as well as what it means to travel abroad, and to spend time in the field observing. Perhaps most poignantly was the conversation about what we sacrifice to study marine mammals, and the loss of women between the post-doc and faculty stages. These conversations continued long into the night after the conference, and were rehashed this past Monday when Holger took the lab out to dinner (thanks again Holger!). I think that is largely the point of these conferences, to learn about the science, to network and meet new colleagues or revisit old ones, and to inspire conversations about topics that may not always make it into the room (like when we’re too busy pouring concrete to think about whether or not having a baby as a PhD student is realistic). In any case, the conference was a great success (from which I needed some serious recovery). Here’s a photo to prove how happy everyone was. 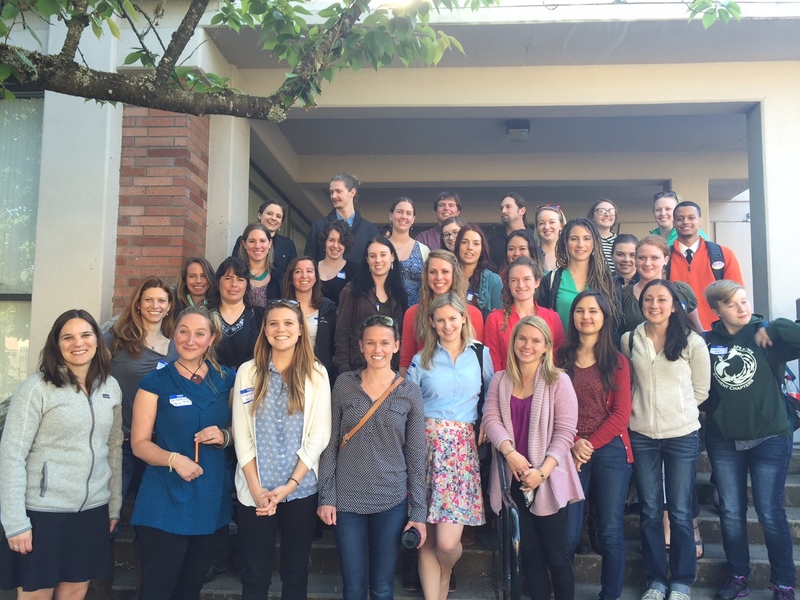 Northwest Marine Mammal Students Unite! Team: Myself, Matt Fowler (NOAA), David Culp (you really should know this name by now), Holger Klinck, Sharon Nieukirk. This post is getting long (you’re still reading! I’m shocked, I would have checked out a few paragraphs ago… but then again I’m ‘busy’). While this section has actually taken up the bulk of my time, describing exactly what it was I’ve been doing is difficult. The answer is fitting shackles, splicing line, shopping at Costco (thanks Sharon! ), assembling and programing hydrophones (thanks Matt! ), zip-tying, drilling holes in metal, taping things, buying heavy things, lifting heavy things, talking about heavy things (thanks David! for all of the ‘heavy things’), and then finally shipping heavy things (although they were nicely packaged onto pallets in meaningful ways). 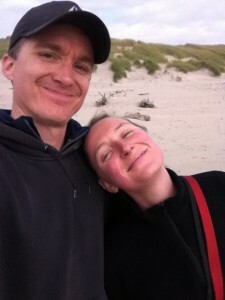 David and I deliriously tired and borderline giddy to see this container ship out. I had a student ask me a few weeks ago what studying whales was like: industrial, I said. This is the little glorified part of field biology. The ability to assemble moorings, and work through the logistics (3/8″ line vs. 5/16″, where do I buy nylon insulator bushings? ), problem solve on your feet (we can’t afford that much heavy chain, what else is heavy and made of lead? ), paired with the ability to handle problems calmly when they arise (the manufacturer sent the wrong pair of release housings and now the instruments don’t fit. Hmm…what to do). I haven’t seen a whale in months; meanwhile the nice guy at Englund Marine went surfing with porpoise while watching gray whales this week. To study animals that live in the ocean in a meaningful way means developing a method to observe them, without changing them. This can be hard, labor intensive, and logistically complicated. It’s also satisfying, practical, valuable, and at times ridiculous. 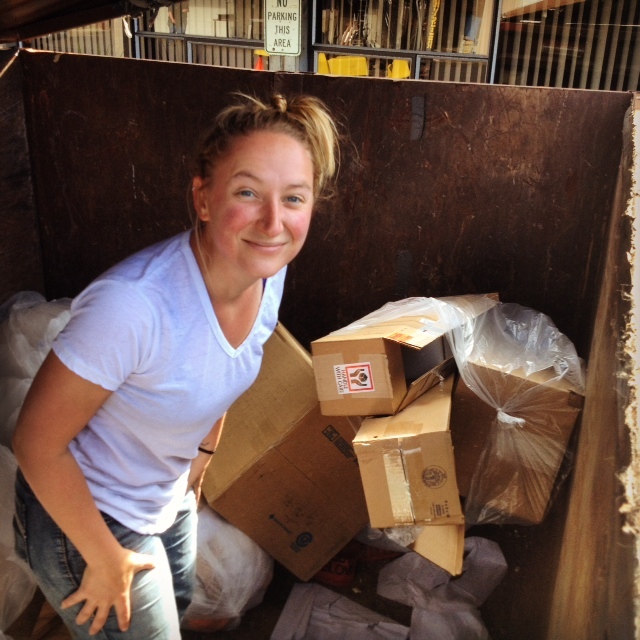 So I’ll tell you this, when the foam inserts that I needed to ship my acoustic releases were accidentally thrown away by the custodians Matt Fowler gave me the grand tour of dump sites at HMSC, and when we got to a large dumpster with my boxes in it? I didn’t hesitate. Miche standing inside the dumpster. Whale research at its finest. 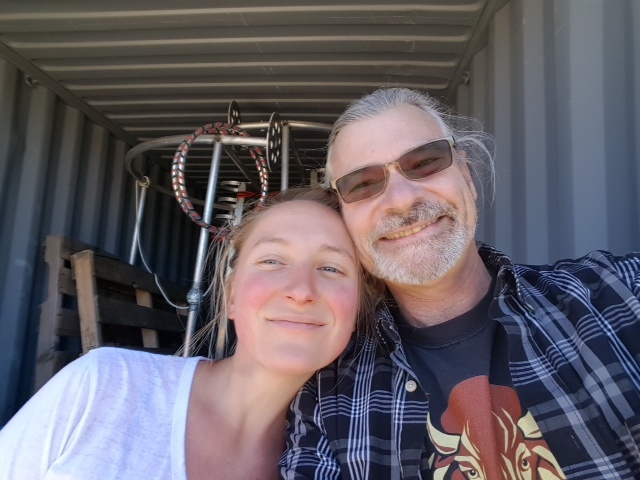 In the end, we got the container loaded with gear (anchors, landers, hydrophones, food, shackles, lines, buckets, tarps, and one hula hoop). Matt and I sighed a collective sigh of relief before we closed the door and gave that metal box a pat. Working with Matt was a pleasure, and as he pointed out now that the hydrophones are built and shipped, our job together is done. This caught me off guard a little; building the hydrophones is just the beginning. Next stop, Glacier Bay. You amaze me! Your phd sounds very ‘industrial’ :). Glad to hear you’re going back to Glacier this summer! Way to rock it Michelle! Glad you weren’t eaten by any bears while camping in Glacier Bay… Tell David I said “Hi”.